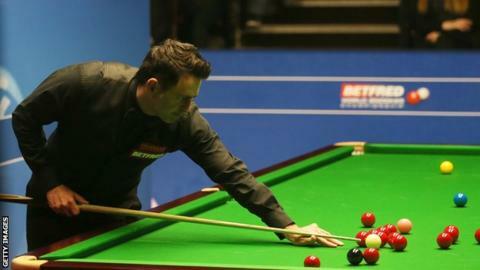 Ronnie O'Sullivan eased into the English Open semi-finals with a 5-2 win over Jack Lisowski in Barnsley. The highlight of the match was a 125 break in frame three on a quieter night for the five-time world champion. O'Sullivan, 41, has been playing in trainers due to an ankle injury, and also let a spectator take his final shot in the third round on Thursday. He faces Scotland's Anthony McGill, who beat Australian Neil Robertson 5-3, in the last four. England's Kyren Wilson will face Switzerland's Alexander Ursenbacher in the other semi-final. Wilson beat Iran's Hossein Vafaei 5-3 and Ursenbacher, who had never previously been beyond the last 32 of a ranking tournament, won 5-0 against Welshman Michael White. Other than the already-qualified O'Sullivan, the rest of the semi-finalists are playing for a place in the upcoming Champion of Champions event. McGill currently occupies the lowest qualifying spot and would be edged out by a win for either Wilson or Ursenbacher.